If you have ever heard us perform then you would already be familiar with Ed Stilley and his instruments because we play them in most every show. We created this page to celebrate this Arkansas treasure and to augment our new book about him and his life’s work. You can hear for yourself a dozen of Ed’s creations, as well as recordings of Ed Stilley himself preaching and singing with the sound files we have provided. In 1979, Ed Stilley was leading a simple life as a farmer and singer of religious hymns in Hogscald Hollow, a tiny Ozark community south of Eureka Springs, Arkansas. Life was filled with hard work and making do for Ed, his wife Eliza, and their five children, who lived simply, as if the second half of the twentieth century had never happened. But one day Ed’s life was permanently altered. While plowing his field, he became convinced he was having a heart attack. Ed stopped his work and lay down on the ground. Staring at the sky, he saw himself as a large tortoise struggling to swim across a river. On his back were five small tortoises—his children—clinging to him for survival. 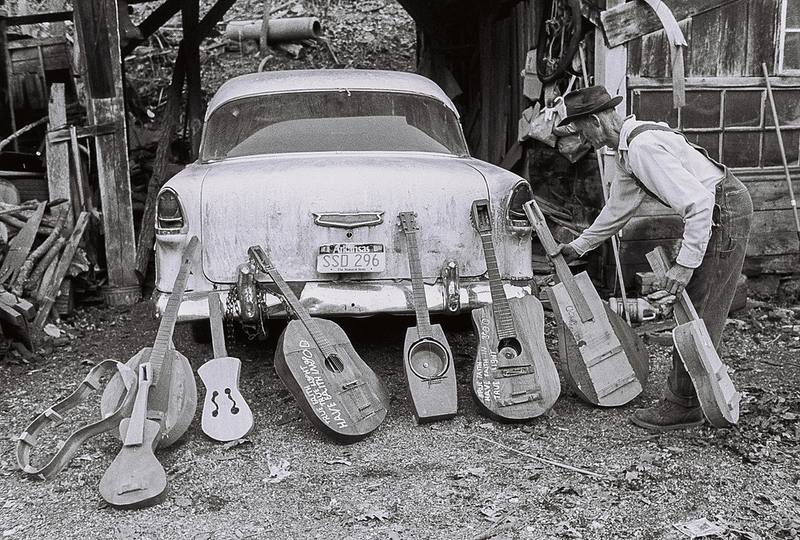 And then, as he lay there in the freshly plowed dirt, Ed received a vision from God, telling him that he would be restored to health if he would agree to do one thing: make musical instruments and give them to children. The 2015 University of Arkansas Press release, True Faith, True Light: The Devotional Art of Ed Stilley, documents Ed Stilley’s life and work, giving us a a glimpse into a singular life of austere devotion.